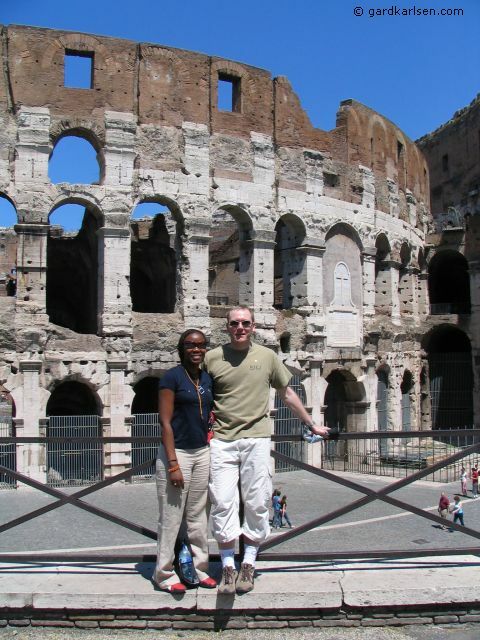 This trip report will focus on the trip that my wife Nikki and I took to Rome in the period from July 2nd - 7th 2005. We targeted out places that we wanted to see during our trip. 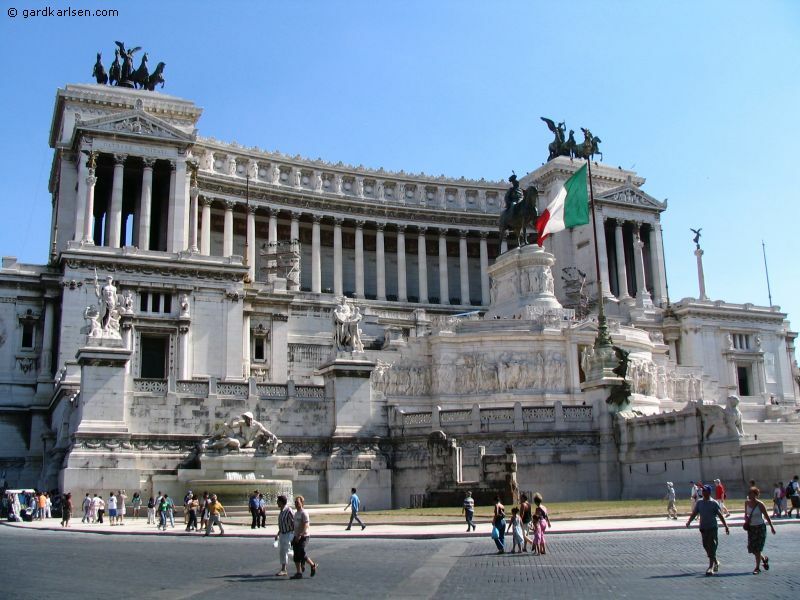 On our list was the usual stuff such as the Vatican, Pantheon, Piazza di Spagna, Colosseum, Forum, Capitol etc. With all of this on the list there was no rest for the wicked :-) The trip report is split into sections. This first part has a focus on our stay in Rome, the second part will focus on eating and drinking in Rome, third page will have more pictures and the last page contains a short review of the hotel we used. Please get in touch if you have any questions or comments. All pictures are taken by Nikki and Gard with our Canon Powershot S1 IS camera. Click here to check out my Rome Google map. Our initial plan was to fly from Stavanger to London to take part in a wedding and then use Ryanair to get to Rome and just book a hotel on the web. But after our trip to Japan we checked out Expedia options again. We ended up with a package deal from www.expedia.co.uk. As always it is tricky to know which area of the city to stay in when you don’t know the place. We posted in different forums and also read the Eyewitness guide book that we bought from www.amazon.co.uk (excellent place to buy books by the way and cheaper then buying them in Norway). Many of the hotels that we looked at were located in the Termini area…and the feedback from others was that this area was a bit seedy. But we took a chance anyway and booked a room at Bettoja Hotel Nord Nuova Roma. The Expedia package included the flights from London to Rome (and back of course) and 5 nights at the hotel and we paid 722 £ for this…not a bad deal considering it was high season and a 3 star hotel. After a short stop in London we had to get up at the crack of dawn to catch our flight at 07.45 am from Heathrow. We stayed at Sheraton Skyline Heathrow (should not be confused with Sheraton Heathrow) and they had one of the best beds I have ever experienced in a hotel. But it doesn’t help much when you have to get up before 5 am. The Sheraton Skyline hotel is not far from the airport but you still have to pay 3 £ per person for the Hoppa service. Most Heathrow hotels do not have a shuttle bus service, so the Hoppa, which stops at Heathrow’s terminals, can be used to get to an airport hotel. After this trip we have come to the conclusion that Heathrow is a lousy international airport. The airport seems like a labyrinth at times, finding the bus service can be tricky, information services people that we asked for help were less than friendly, the traffic outside some of the terminals were ridiculous etc. But enough complaining about the Heathrow airport. We did eventually get on board our Alitalia flight and we got a nice breakfast after take off together with some of the best coffee (airline and otherwise) we have ever tasted - and this is not based purely on the fact that we were half asleep and in need of a jolt. Since the hotel is located near the Termini train station we decided to just walk to the hotel. We arrived on track 28 which is located at the back end of the main station entrance, and followed the exit signs until we ended up in the street. The Termini station turned out to be huge and walking to our hotel took a bit of time…especially when the navigator gets his bearings wrong (yes, I was carrying the map). But instead of sweating outside of the Termini I would advise you to follow the Metro signs instead of the Exit signs when getting of the Leonard Express. 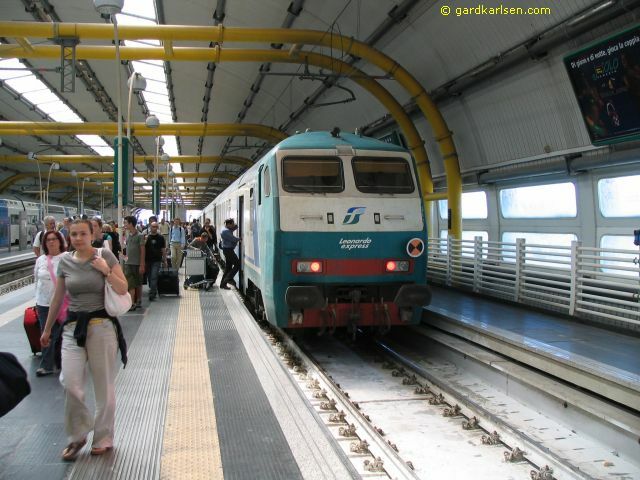 This will take you towards the front of the Termini station and there is even a conveyer belt on a lower level. I normally don’t mind dragging my Samsonite along but in Rome it got a bit long and it was already quite warm. The hotel we stayed at was near the Termini station which makes it a part of the Quirinal area…it is actually one of the original 7 hills of Rome. Getting around in Rome was not that difficult. 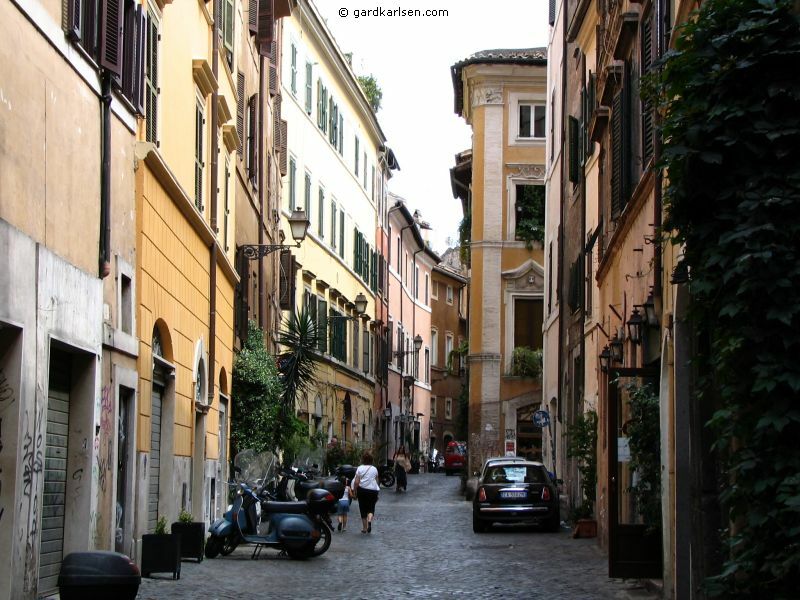 The inner city of Rome is not that big so it is possible to cover a lot of the city on foot. It was quite easy to take the bus around and if you live in the Termini area you should remember that there is an open air bus station in front of the main Termini entrance. There’s an information booth which even has a sign listing all the different sights and which bus to catch. Tickets can be bought for 1 € at a machine or newspaper stand,which is then fed into a stamping machine when you board the bus. Note that you can’t buy the tickets on board the bus itself! I guess we should have bought a bus pass or something like that but we didn’t ask and no signs mentioned it. Trying to take the bus back to Termini was also easy but the only trouble was finding a ticket machine or open newsstand. So I hate to admit it…but a few nights we did catch the bus back without a valid ticket - and we were certainly not alone in this :-) Our main bus routes were 64 and 40 as they leave from Termini to Piazza Venezia, past stops where you can jump off to reach Piazza Navona and Pantheon and then across the Tiber to the Vatican. There are lots of warnings about pickpockets on these buses but we never experienced anything while riding the bus. There was a day when we took the bus and Nikki tried to save me a seat while I was going to the machine to get the tickets stamped. Some ‘lady’ came over and indicated that she was going to sit down. Nikki tried to tell her that she was saving the seat for me and she was pointing at me standing just a couple of meters away. But the ‘lady’ didn’t want to listen to that at all and she just grabbed the seat. That would be considered a bit rude here at home but I guess the rules are different in Italy :-) It was not a big problem for me because it was a short bus ride. Rome also has a Metro system (here is a subway map) but we didn’t really take it that much since it didn’t include stops nearby the places of interest. Our guide book didn’t really have a good Metro map (shame on you Eyewitness guides) so we were not really aware of how extensive it was. But taking the metro is just as easy as metros in NYC, Tokyo, Paris etc. The tickets were 1 € and just be sure to catch the train in the right direction. 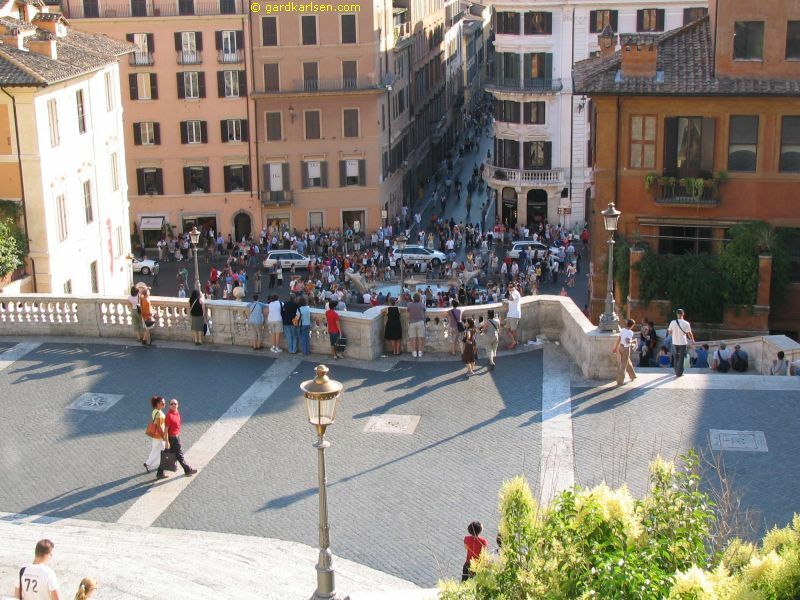 It is easy to get from Termini to places like Piazza di Spagna (Spanish Steps) and Colosseum. We felt a bit uneasy when we got off at the Termini station and the police were there with big German Shepards that were sniffing people up for drugs and whatnot. 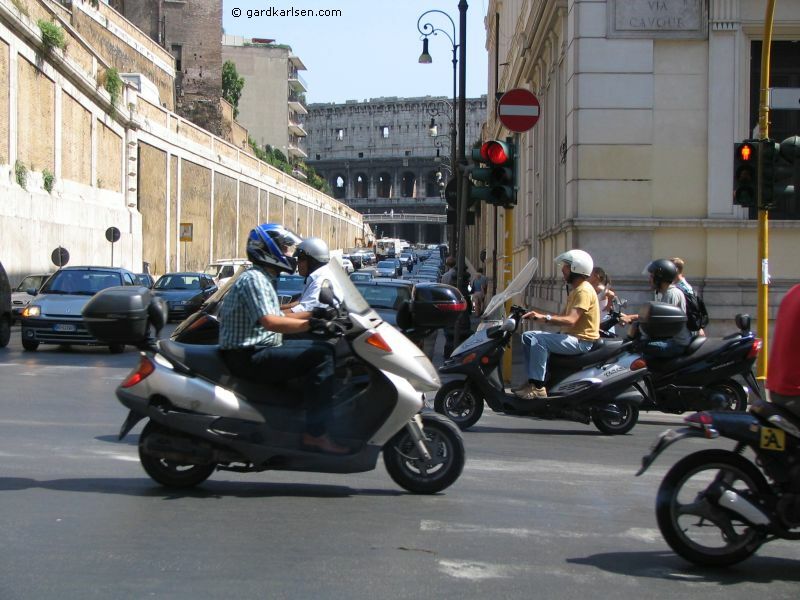 There is a lot of talk about Roman (and Italian) drivers being a bit…eh..agressive :-) But we didn’t have that much trouble when walking around in Rome. 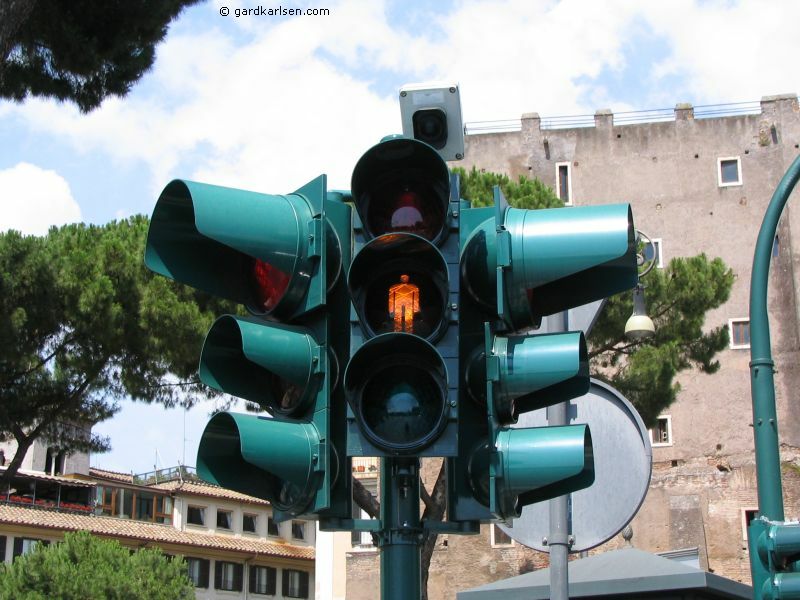 In bigger intersections there are traffic lights …but remember the green man doesn’t last very long…and it was the first time I experienced that there was not only a green and a red man…but also an orange man. I guess that indicates “You better hurry up” :-) I found it quite amusing to read the guidebook’s guide to crossing the street in Rome “Step purposefully into the road, facing approaching motorists with a determined glare”. Trust me…it was not that bad but you better keep and eye on the traffic because the pedestrians are not the boss around the streets of Rome. We didn’t stay long at the hotel before we got into the streets and under the blazing sun. Sightseeing in Rome is hard, man! It is hard to come to terms with the fact (even when reading a guidebook) that there is so much to see and do in the ‘Eternal City’. I think I now understand why it is called the eternal city…the history stretched so far back that it puts everything else into perspective. E.g. when the Roman Empire starts to “collapse” in the third century we had only come to the Iron Age here in Norway. In Stavanger there is a reconstruction of an Iron Age farm and it is not nearly as impressive as Rome…and it would still be another 400 hundred years before the Vikings had their glory days. If you want to read more about the Roman Empire check out this page: http://www.roman-empire.net. But let’s get back to sightseeing in Rome. 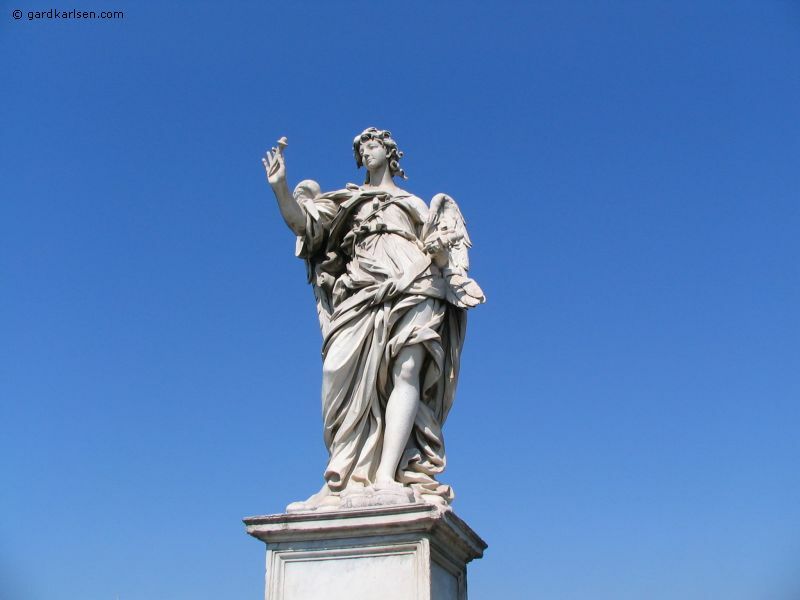 The hotel is located only a few minutes walk away from the church Santa Maria Maggiore. Parts of the church date back to the 5th century and I guess in most other cities it would have been a main attraction. But in Rome it has to “compete” with so many other amazing building so there were hardly any tourists there. According to one source the church has been decorated with some of the first gold Christopher Columbus brought back from America. We only walked around and we found a tourist information stand where we picked up a free map made in connection with TrambusOpen. This company runs double-decker buses around Rome and the map shows the routes but it also shows the points of interest in an excellent way. We were thinking of taking this on the first day to get an overview of the city. But the bus routes had been changed due to the Live8 concert so we never got around to taking it. I think the price for a day is about 15 € but the buses seemed quite crowded (at least on the open air upper deck). We walked down Via Cavour (a bit more quiet compared to the parallel Via Nazionale) as it seemed to lead down towards the centre of town. It didn’t take long before we started seeing some ruins when looking into the side streets on our left hand side. Nikki and I were both like “Is that….? ?”….and yes, we were starting to get the first few glimpses of the Colosseum. 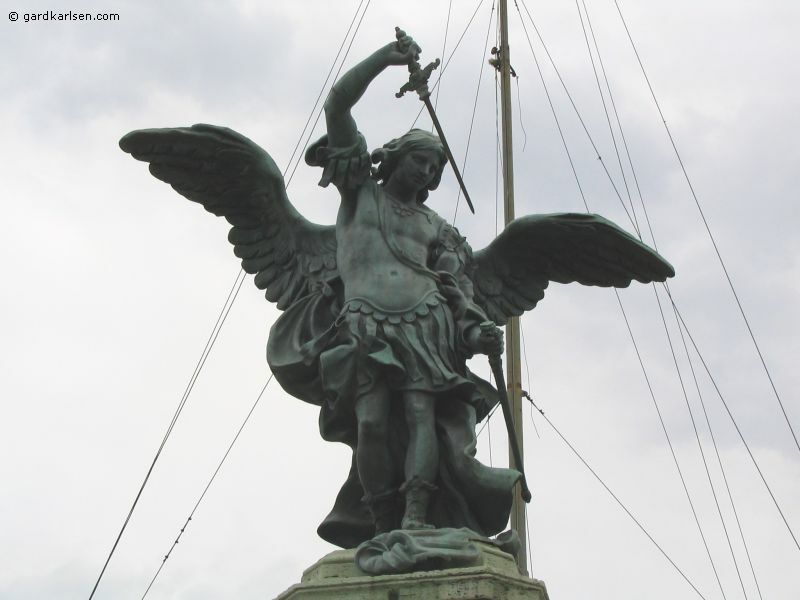 But I think we were even more stunned when we came to Via dei fori Imperiali. 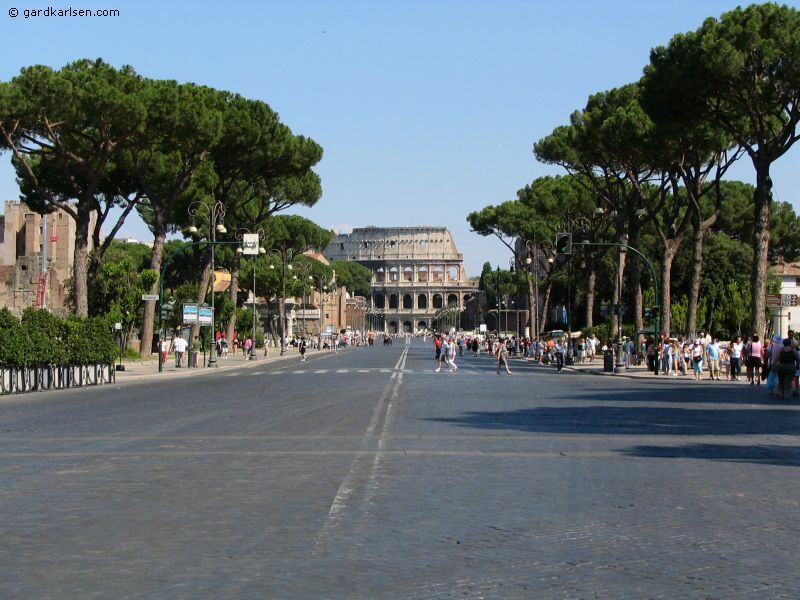 This street was laid out by Benito Mussolini in the 1930’s and it connects Piazza del Colosseo with Piazza Venezia. 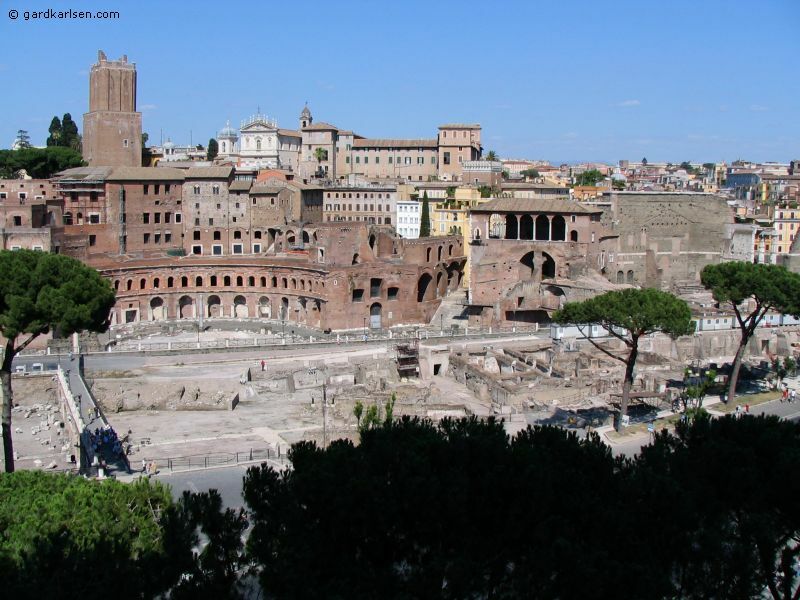 Here you also get a great lookout point over the Forum (Forum Romanum) and Palatine areas. Most of the Forum is in ruins today but this was the heart of ancient Rome. I’m not sure why but it is quite breathtaking to look out over this area and realize that this is one of the places where our modern civilization started. 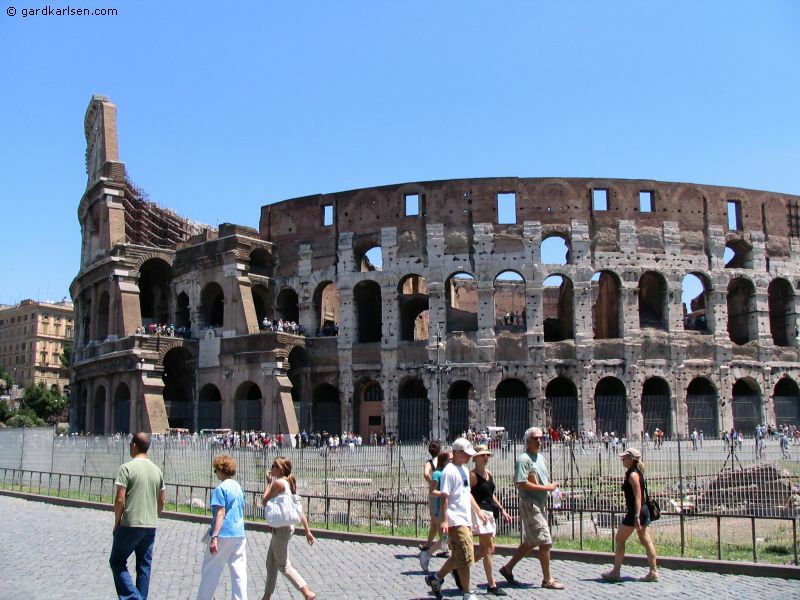 I think most people have heard about the Collosseum (also known as Colosseo) through history lessons or movies (like Gladiator). 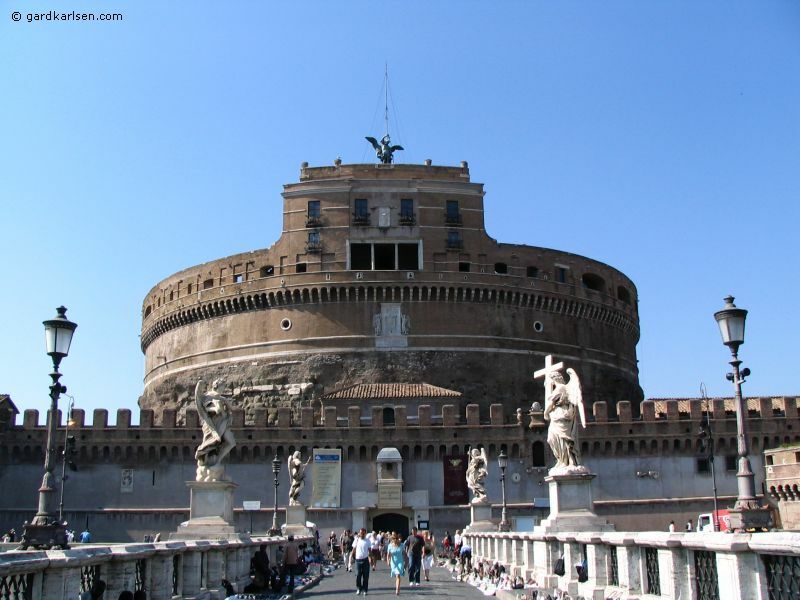 It was commissioned by Emperor Vespasian and when it opened in about 80 AD it could hold about 55.000 to 85.000 people (the numbers vary a lot). 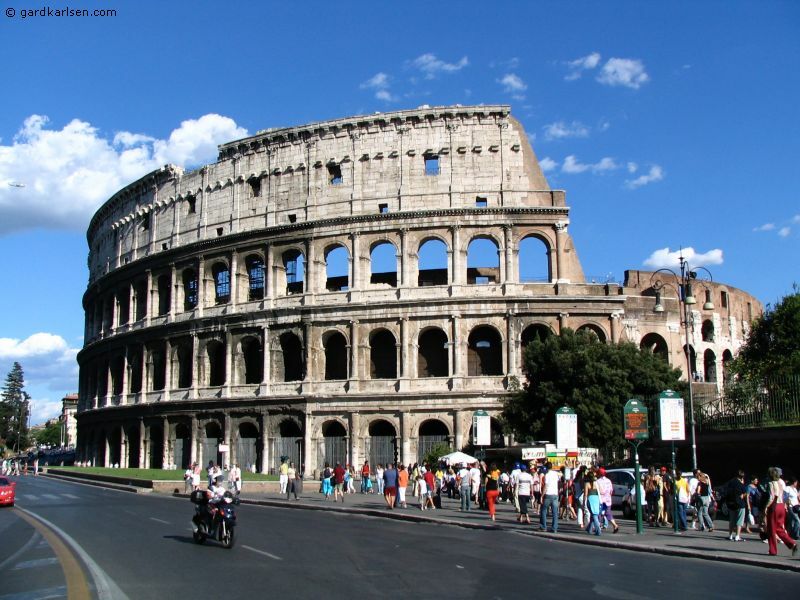 The “real” name is actually Flavian Amphitheater (due to the Flavian emperors at the time) but it was later called Colosseo due to a colossal statue of Nero which was located at the amphitheater in ancient times. Well, the rest is history I guess. 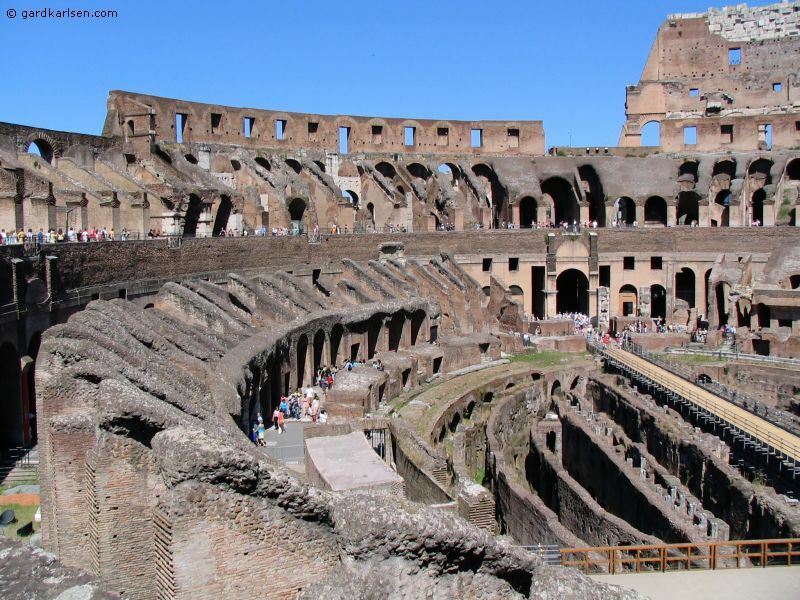 As most of you know the Collosseum became home to gladiator fights, exotic animals fighting etc. 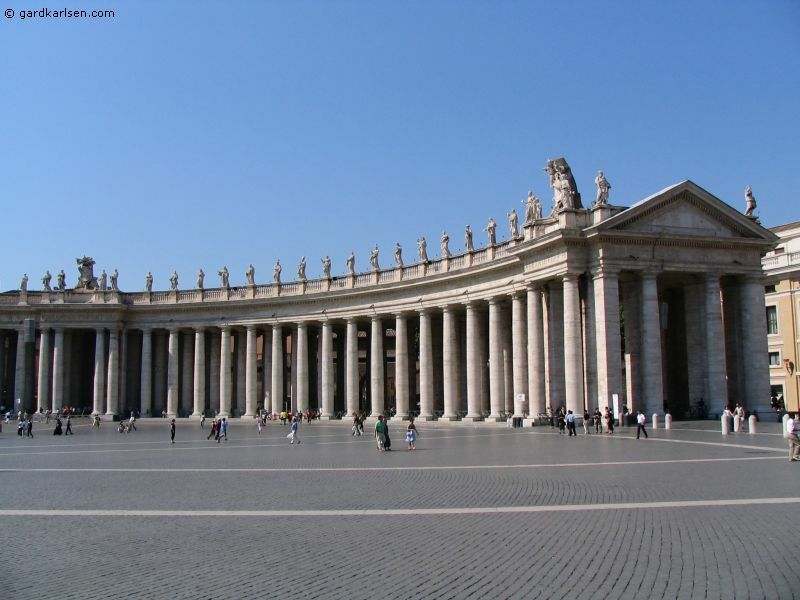 But over the years this beautiful building declined due to earthquakes, pillaging (the Vatican was supposedly also built with parts of the Colloseum’s marble)etc. But even today it is possible to imagine how amazing it must have been when it was complete…standing 188 x 156 meters and 50 meters high. There are stalls selling cold drinks right on the outside of the entrance to the Collosseum but it is of course more expensive compared to crossing the road to the Spar. Near tourist attractions you end up paying about 1 € for a small bottle of water while you can get a 2 litre bottle for about 0.5 € at the grocery store. There were also quite a few beggars around. One lady was walking with a stick and she was bent so far forward that she looked like she was about to fall over. This position also hid her face. There is nothing funny about people begging but this became a bit comical because kids started getting curious so they were bending over too to get a glimpse of the beggar’s face. After we had been to the Collosseum we had a self made snack with ingredients bought at the Spar. The guided tour of the Forum and Palatine, which was included in the Colloseum tour we bought, started shortly thereafter. 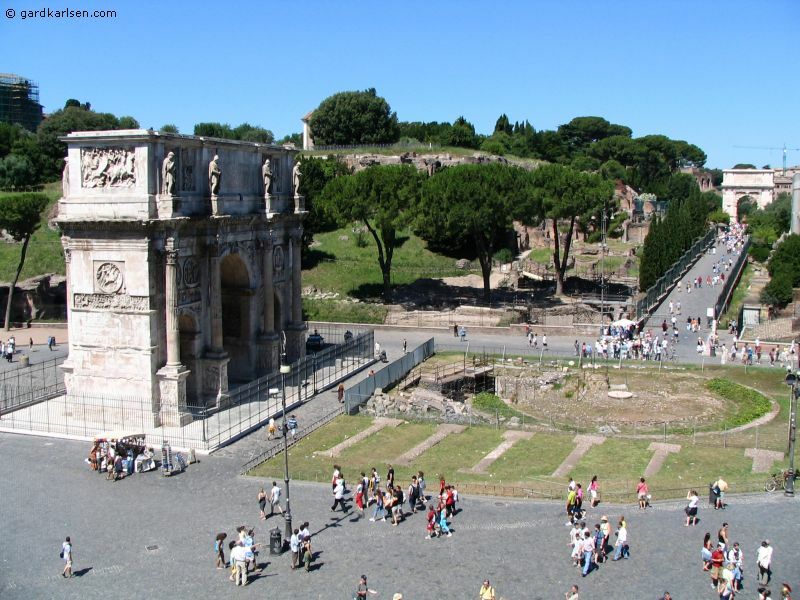 We started our tour with the Arch of Constantine which is located right next to the Collosseum. 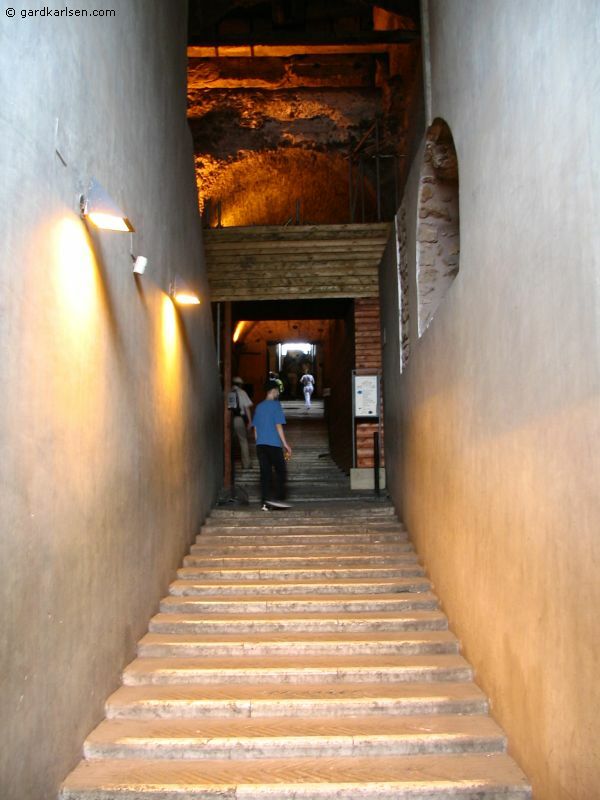 From there we moved up Via Sacre (the sacred way) where it is still possible to see the marks made by chariots. This road used to be the route taken for religious and triumphal processions towards the capitol. The tour didn’t last that long but we were taken to the Arch of Titus and we moved up to the Palatine hill. This hill is where legend has it that Romulus and Remus were brought up by a wolf and it later became the location of palaces to the Flavian emperors. 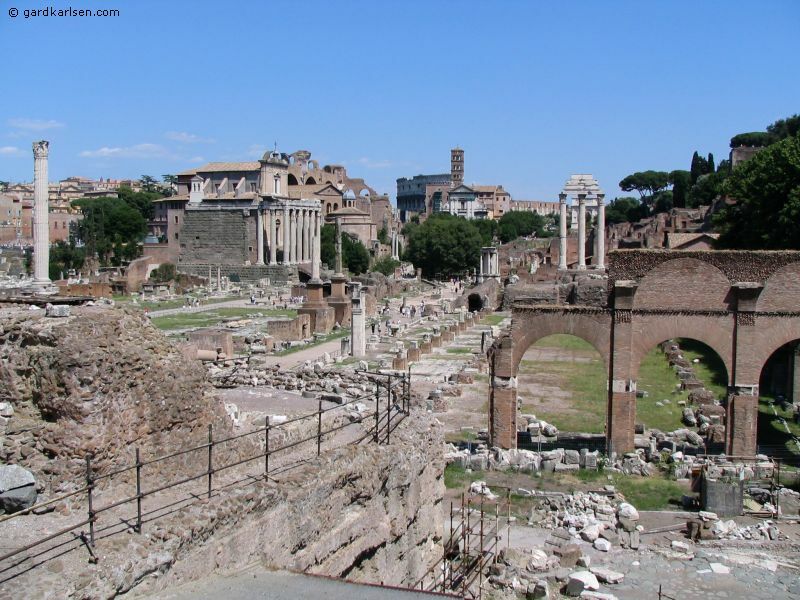 At the edge of the Faranese Gardens you get a great view of the Forum. After the tour we walked around the Palatine area on our own. Today most of the area is in ruins but it is possible to see that this must have been spectacular when it was complete. From Domus Augustana - where the Roman emperors used to live - to Domus Flavia that were used for public functions. From the south side (from Domus Augustana) you get a great view towards Circo Massimo (Circus Maximus). This used to be the largest stadium in Rome but today it is just a grass field…and when we were there - home of the Live8 concert in Rome. 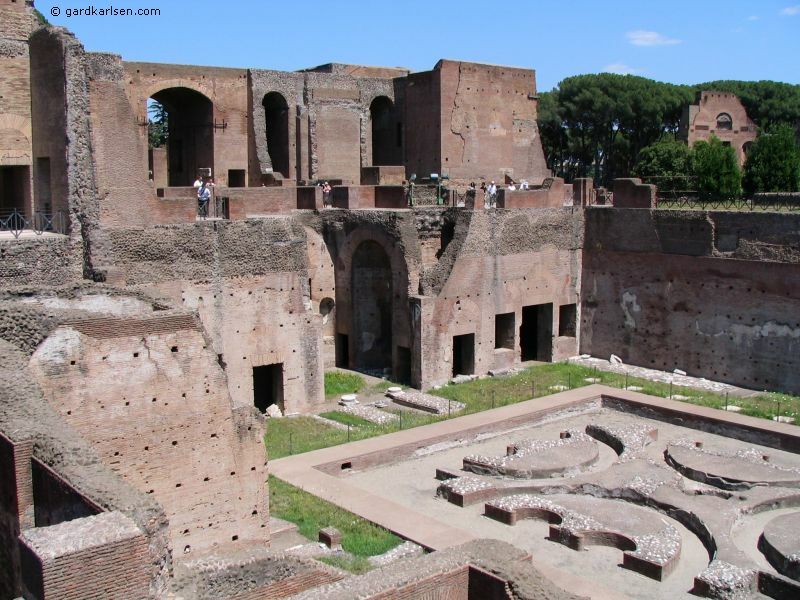 After we had walked on the Palatine hill we returned to the Forum area to check it out further. 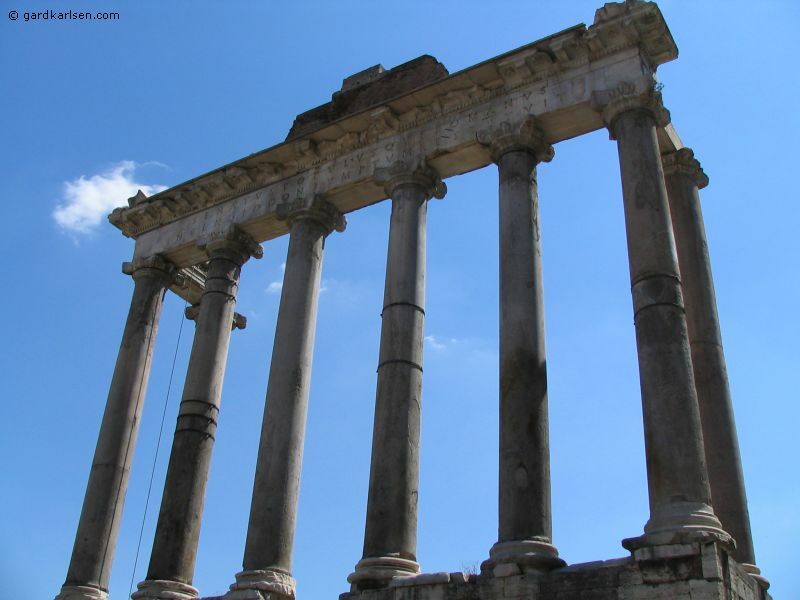 I will not go into details about the ruins that you find in the Forum. Take a few hours and walk through the area with a good guidebook or get a guide to show you around. 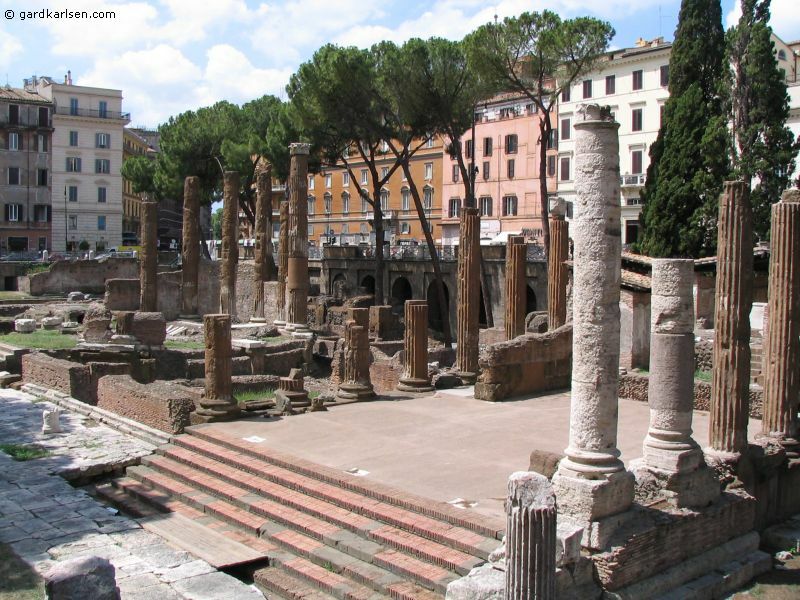 In the area you will find ruins like basilica of Constantine and Maxentius, Rostra, Temple of Saturn, Temple of Castor and Pollux, House of the Vestal Virgins, temple of Vespasian, temple of Julius Caesar etc. The list goes on and on actually and it seems like they are still working on excavations on different locations. Tip! 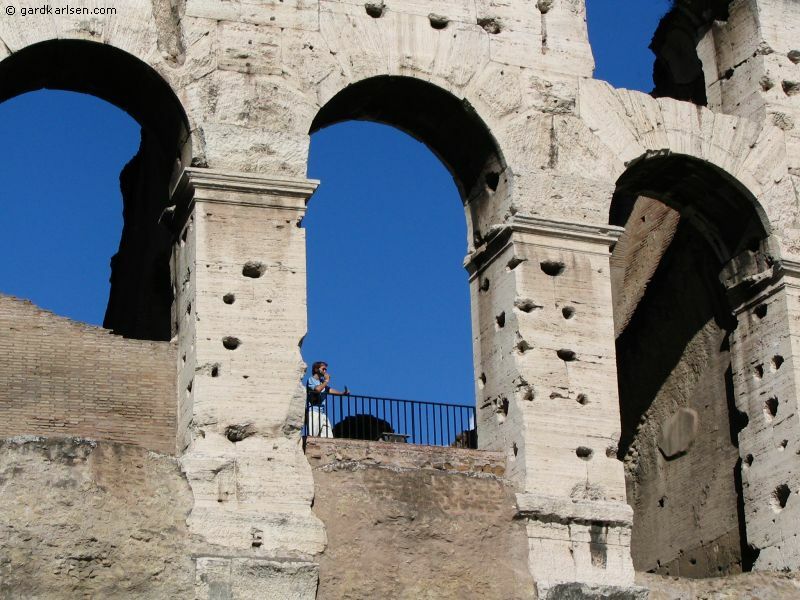 I think that the ticket you buy at the Collosseum is also valid to enter Palatine. You can also buy a ticket to enter Palatine and use this at the Collosseum. This is probably the smartest as the line is always longer at the Collosseum ticket counter. If you are up for more after covering Colloseum, Palatine and Forum you can walk to Capitol which is located right next to the Forum area. According to the guidebook this was the centre of the Roman world (hence then name capital, I guess :-) and even today this is the home for the people in power…today it is the home of the city council. 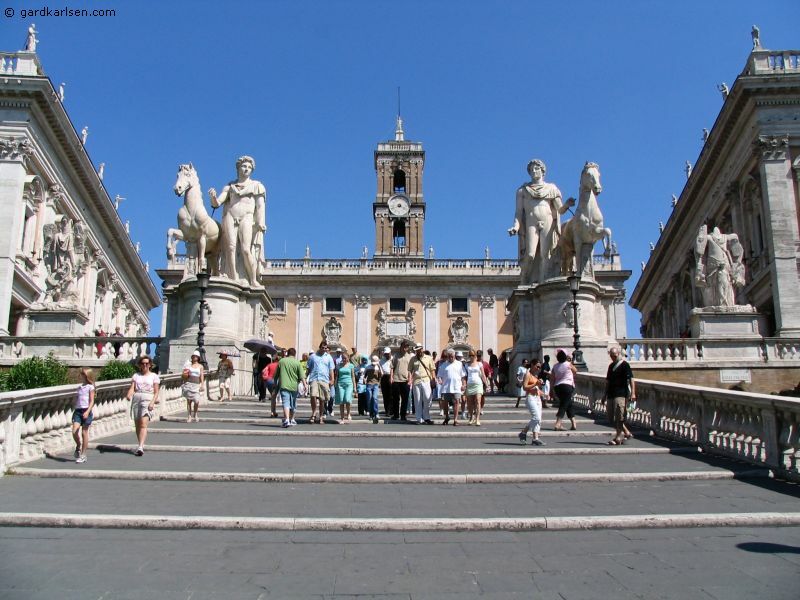 We walked up to Capitol from the Forum side and we walked past the remains of the temple of Juipiter, past Tarpeian rock where traitors where thrown of the cliff to their death in ancient times and we ended up in the famous Piazza del Campidoglio. The square was designed by Michelangelo and in the middle of the geometric lines there is a big statue of Marcus Aurelius on a horse. The piazza faces west and as you go down the great staircase you can see towards the Vatican and St. Peter’s. The piazza itself was pretty crowded when we were there but the Capitoline museums were not. 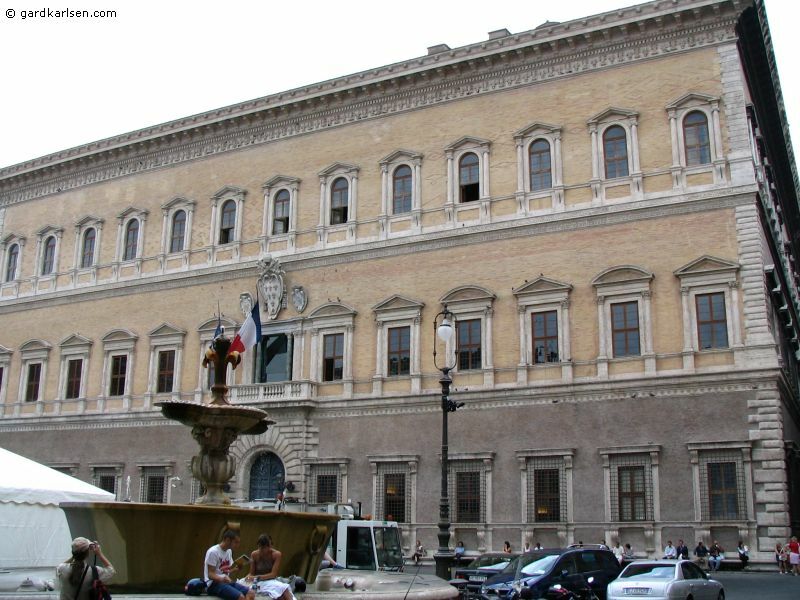 The museums are called Palazzo Nuovo and Palazzo dei Conservatori and are amongst the top tourist attractions in Rome. To enter you have to pay 7.80 € per person - you need to have the exact change. We started out looking for the rest room and that was tricky to find. We kept asking guards and they pointed up and down stairs….in the end it got pretty frustrating but we found it in the end. The museum contains statues, frescos, paintings etc and it is easy to get overwhelmed by all the stuff on display. I have a hard time getting over the fact that there are that many ancient pieces that are so well made. Like the bronze sculpture called Spinario. This sculpture is a piece that dates back to the 1st century BC! And there are also the remains of a huge statue of Constantine in the courtyard that dates back to the 4th century. 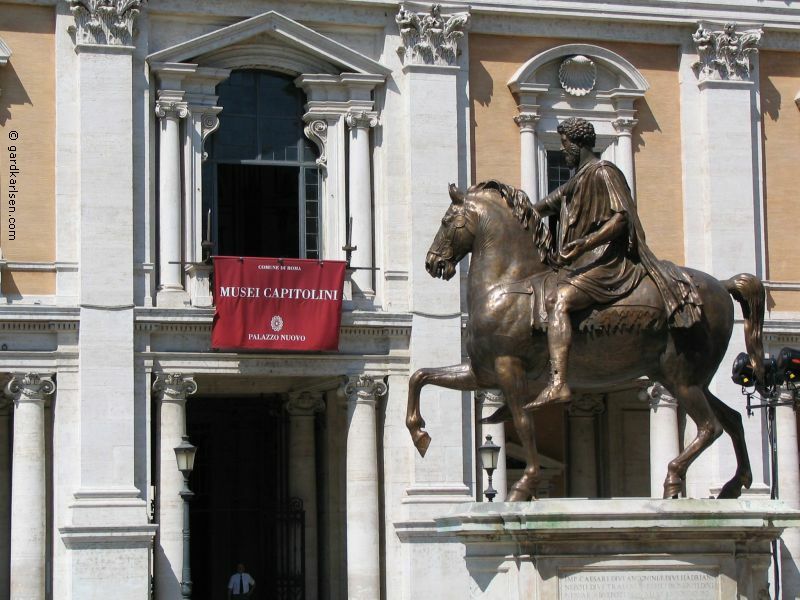 The statue of Marcus Aurelius in the Piazza del Campidoglio is actually a copy. 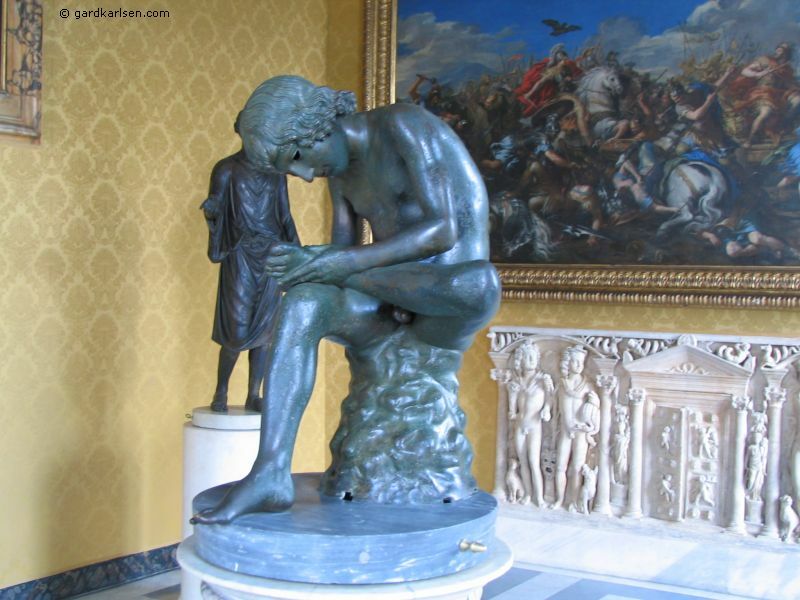 The original 2nd century statue can be found in Palazzo Nuovo. Across the road (Via dei fori Imperiali) from Forum you can see the remains of the Trajan’s market. Built in the early 2nd century AD by emperor Trajan this complex contained 150 shops and offices and I guess you can call it the shopping mall of that time. I’m not sure if it is possible to get a tour of this place…I can’t remember seeing any people there the times we walked passed but according to the guidebook it should be possible to enter this site. Already on the first day we walked from our hotel, past Forum, past Piazza Venezia and it didn’t take us long to get on the track of the Pantheon. We did have a map in the guidebook that we used but there are also a few street signs around Rome pointing towards the main attractions such as the Trevi fountain, Pantheon etc. We walked through some less crowded streets and passed a funny looking obelisk. It turned out to be obelisk of Santa Maria sopra Minerva by Bernini. 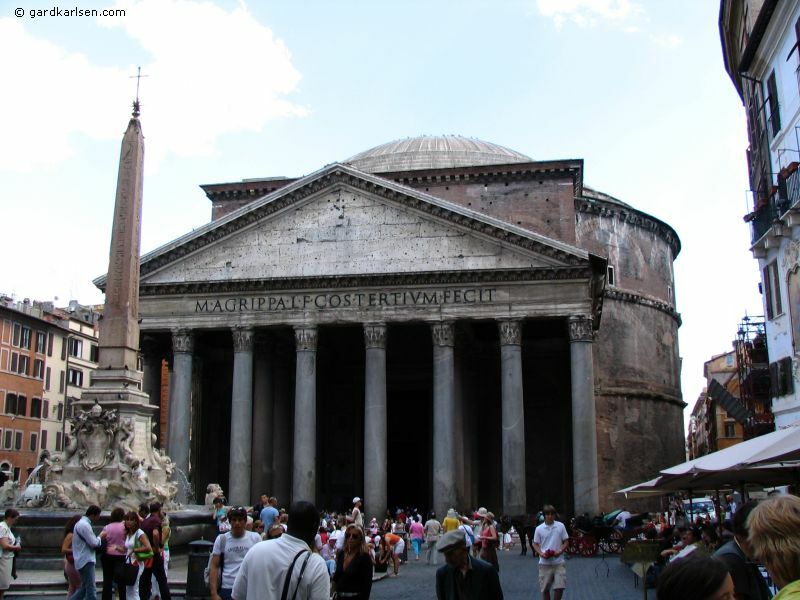 When we came to the Pantheon it didn’t look like much from the outside. We approached from the back and on one of the walls a homeless guy was taking a very restful siesta. But in front of the church there were a lot more people. The Piazza della Rotonda was filled with tourists taking pictures and people resting on the steps of the fountain. The entrance to the church is free and it looks better inside. The main light comes from a hole in the dome itself (known as the oculus) and it provides a nice atmosphere inside. 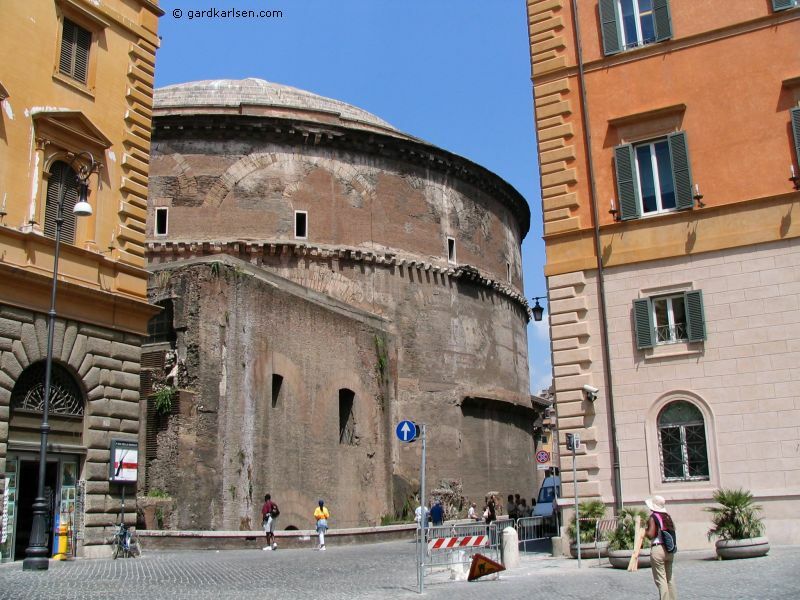 There is not much inside the dome…apart from tombs along the edges of the wall. You will find the tomb of Raphael amongst others. When we were there they were doing some sort of refurbishing to the interior of the dome, so parts of it were covered up. But it was still nice to have a look inside and it is hard to imagine that the walls that are supporting the dome are 6 meter thick. It must have been quite an engineering achievement as this was built in 118 AD! The area around the Pantheon is buzzing with life. 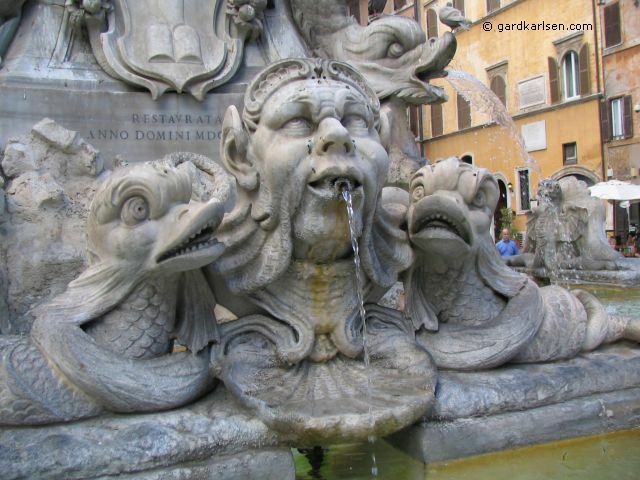 The fountain in the piazza in front of the Pantheon has freaky looking creatures squirting water :-) And along the edges of the piazza there are restaurants and coffee shops. 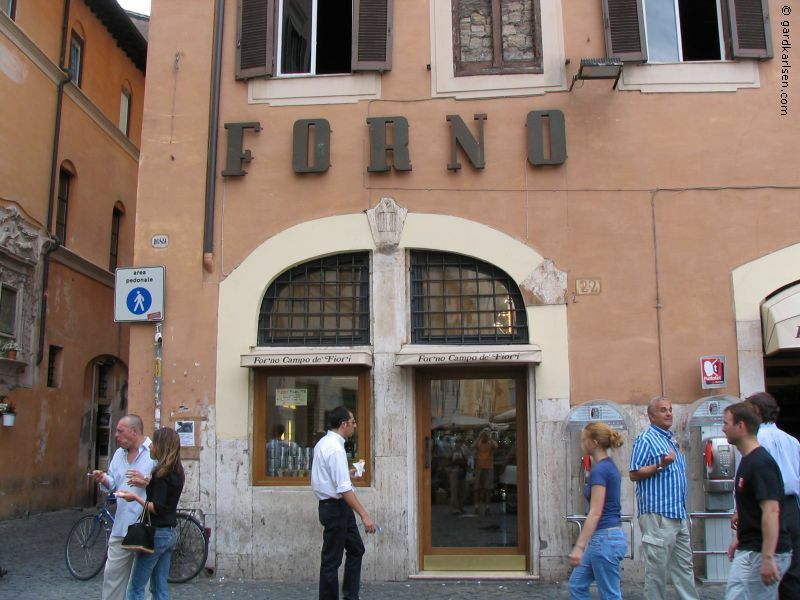 One of the most famous coffee shops is Tazza d’Oro. The first time we went in there I wanted to try out an espresso so I said “caffe” as you are supposed to. But then he asked me back “freddo?”. He caught me of guard and I couldn’t remember what freddo meant so I said “Sure, why not” :-) Well, for all of you that don’t know Italian freddo means cold and when I got to the counter that is what I got…a shot glass of ice cold coffee :-) We tried the (hot) espresso later on and it was good. I also recommend trying the ice coffee (no, not the caffe freddo). The ice coffee seemed to be crushed ice mixed with coffee and then topped with whipped cream. Sounds a bit strange but it was very tasty and very rich. 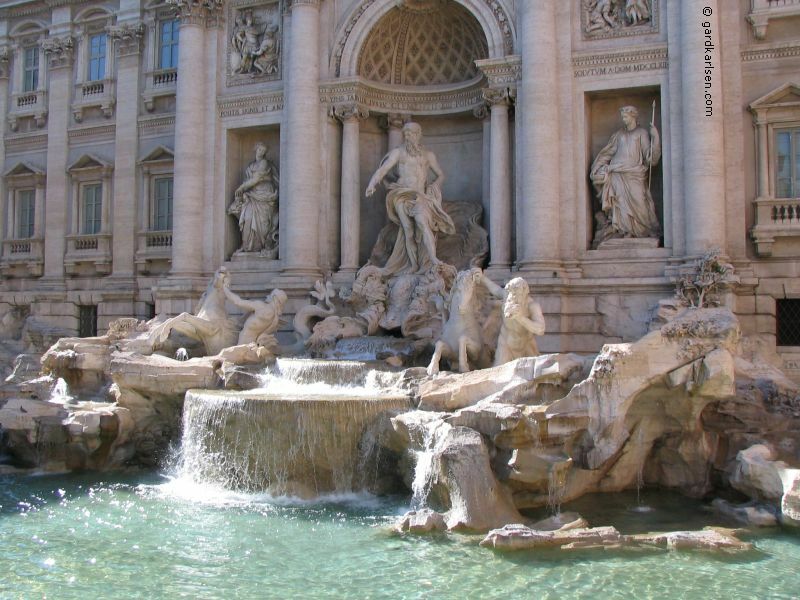 Rome has an amazing amount of fountains and one of the most famous one is the Trevi fountain. According to what I have heard it was made famous by Fellini's movie "La Dolce Vita". I haven’t seen the movie but I think most people will understand why it is so popular when they get there because it is huge and beautiful. The only problem is of course that every other tourist in Rome seems to be there too and it was crowded each time we passed it (day and night). The legend has it that if you throw a coin into this fountain it guarantees your return to Rome…hmmm, I have to admit that we never got around to that but I do hope that I will return to Rome one day anyway. But there are lots of people that do throw in coins and a few years back there was a homeless guy that made a (good) living out of collecting the coins at night. And in the end there was a trial about whether he should be allowed to do this or not :-) The Trevi fountain is well worth a visit but remember that it will probably be quite crowded so it is hard to take good pictures of the place. Back to the Piazza Navona…the shape of the piazza is long and thin and this is due to the fact that it is built on the ground of an old circus…Circus Domitianus). The piazza is today very lively as it has lots of restaurants along the edges and there are lots of people trying to sell everything from blinking flying saucers to fake brand name hand bags. 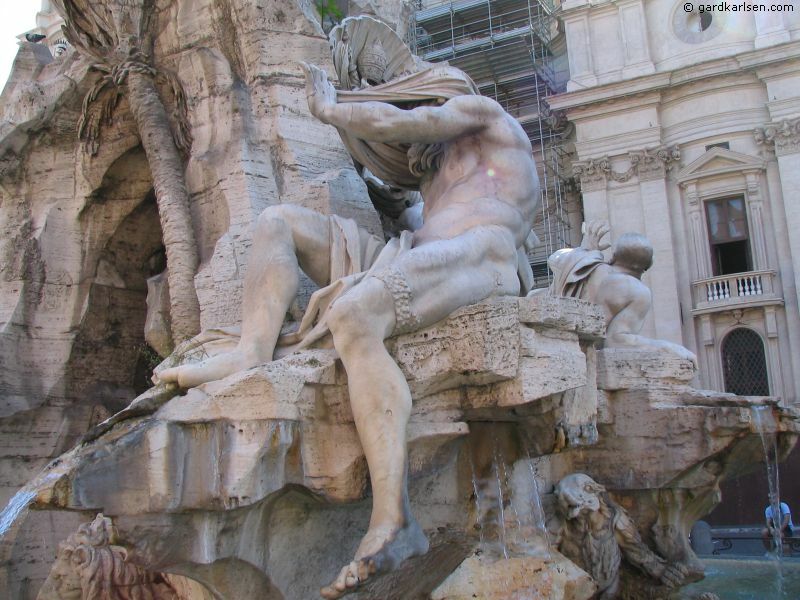 In the middle of the piazza you will find the most spectacular of the fountains in the piazza: Fontana dei Quattro Fiumi (fountain of the 4 rivers) designed by Bernini. 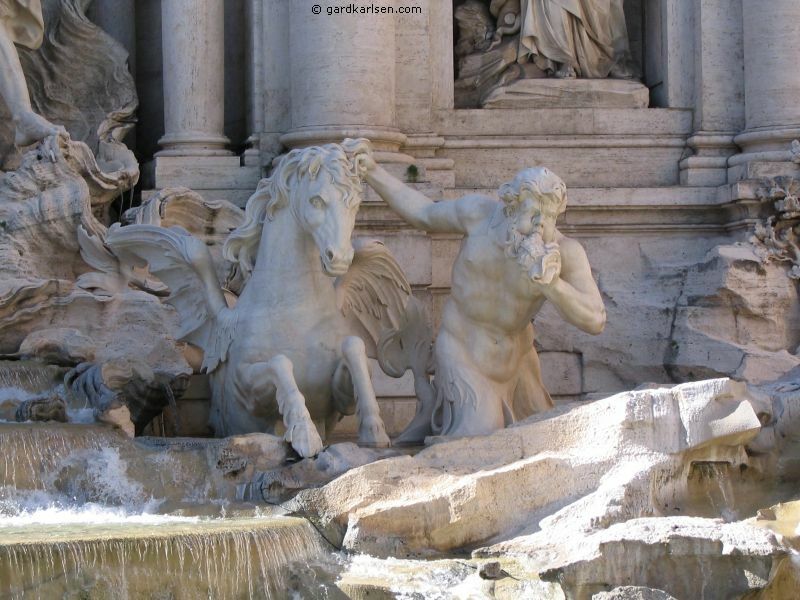 According to the guidebook the 4 giants represents the great rivers of the time (Ganges, Danube, Nile and River Plate). 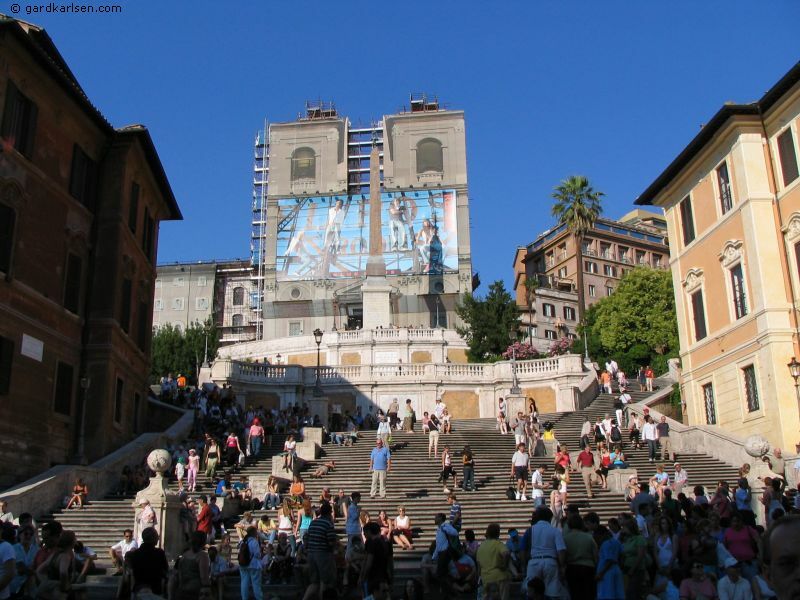 Not far from Piazza Navona we found another famous landmark in Rome: the Spanish steps. It took us a few days before we prioritized going there but after we had been to the Vatican one day we just walked over past Piazza Navona and we continued walking towards Piazza di Spagna. It was not that hard to tell when we approached the piazza as it was getting quite crowded. After walking through some of Rome it was nice to sit down on the steps (even if the stone was quite warm from the blazing sun) and relax and look at all the people. I’m not sure if I would call the Spanish steps a disappointment but if you are only in Rome for a short period of time then it shouldn’t be at the top of the list. As with the other main attractions in Rome it was of course quite crowded and it was even hard to see the fountain at the bottom of the steps as there were so many people resting on it. If you want to get some shopping done you can try the area around the Spanish steps…but I guess you have to be prepared to cough up a bit of money as the shops along the streets include the likes of Gucci, Max Mara, Salvatore Ferragamo, Giorgio Armani and Louis Vuitton :-) We didn’t stay that long in the area…for us it was quite easy to get back to the hotel as there is a metro station right by the piazza and it is only a couple of stops away from Termini. We continued to walk until we came to the Tiber again and we crossed it using Ponte Sisto to get into the area Trastevere. The bridge was commissioned by Pope Sixtus IV …the same guy who had the Sistine chapel built. According to the guidebook he was behind a lot of building and restoration around Rome and it got him into financial trouble and in the end he had to levy a tax on the prostitutes to raise more money :-) We found the area around the bridge to be a bit dodgy. When we crossed it there were a couple of people begging for money and a strange looking guy walking around with a dog that didn’t look too pleasant. The Trastevere area has a reputation of being the home of the most authentic Romans - whatever that is. We didn’t walk around that much in the area but it looked very nice with narrow streets laid down with cobble stone and it was also very quiet since there wasn’t that much traffic around. One of the things I was looking forward to was the visit to the Vatican. No, I’m not very religious but who has not heard about the Sistine Chapel, St. Peter’s Church, the Pope etc :-) I guess it has all become much more “famous” after Dan Brown’s book “Angels & Demons” (yes, I have read it but that was long before I knew I was going to Rome). After we had finished the tour at the Palatine we saw another tour group and we asked for a brochure. The company was called “Discover Rome” and one of their selling points is guides that are native English speaking. We got up really early to get to the assembly point near the Vatican at 8.15 am. We took bus no. 40 as usual and we got there just in time. And no, you don’t have to bring your passport to enter the Vatican :-) The line outside the Vatican museum was already starting to grow so we all got into the line and we were told by the guides to keep a tight formation to avoid people cutting into the line. 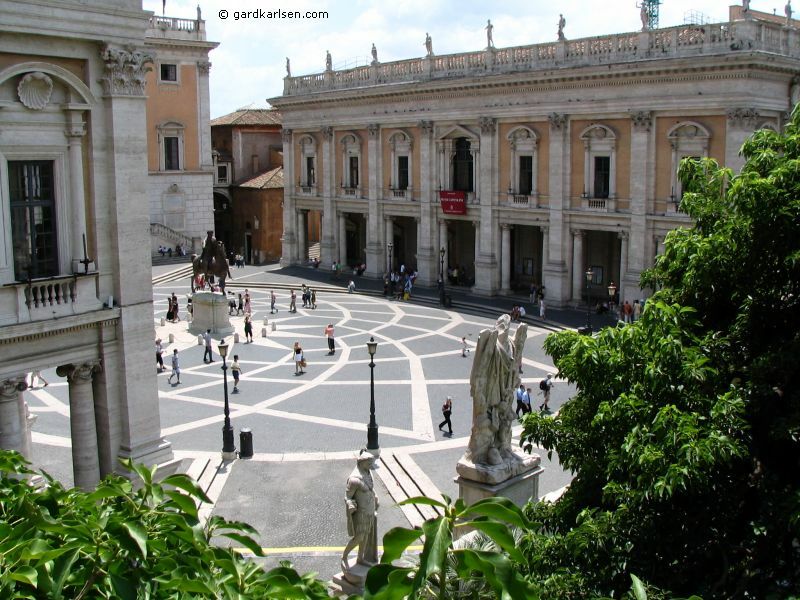 The museum entrance is located on the right hand side of St. Peter’s …follow Via di porta Angelica from St. Peter’s square to get there. We paid 30 € for the tour and 12 € for the entrance itself. There also seemed to be the possibility of hiring the museum’s own guided tour headsets. Even though we got there early it took about an hour before we got in and the security is about as tight as most airports. Tip! The sun is strong even in the morning and it gets hot really fast. Remember to bring some water as water at nearby kiosks costs 1 € for a small bottle. And remember that there is a dress code when going into churches…no shorts or sleeveless tops allowed. So I love my convertible pants on days like that :-) Our tour lasted quite long (until about 2 pm) so remember to bring along something to nibble on and something to drink so that you don’t loose interest in the tour. After the tour there are places to eat around the tour assembly point (Piazza Risorgimento). Our guide Tony was pretty good and he was also quite amusing and we got lots of details that I don’t think we would have found in the guidebook. But he was also a bit full of it. When one kid outside our group started questioning some facts, Tony got into a discussion with him and in the end Tony said “I have a PhD on this subject”…end of discussion in other words :-) Our guided tour of the Vatican Museum started out in a court yard where we took a look at posters that showed what to expect once we got to the Sistine Chapel. Then we started the tour itself and we got to see statues, painting, frescos etc. As in the Louvre it is easy to get totally overwhelmed so Tony focused on some pieces in each hall. One of the pieces that I remember the best is probably Laocöon. 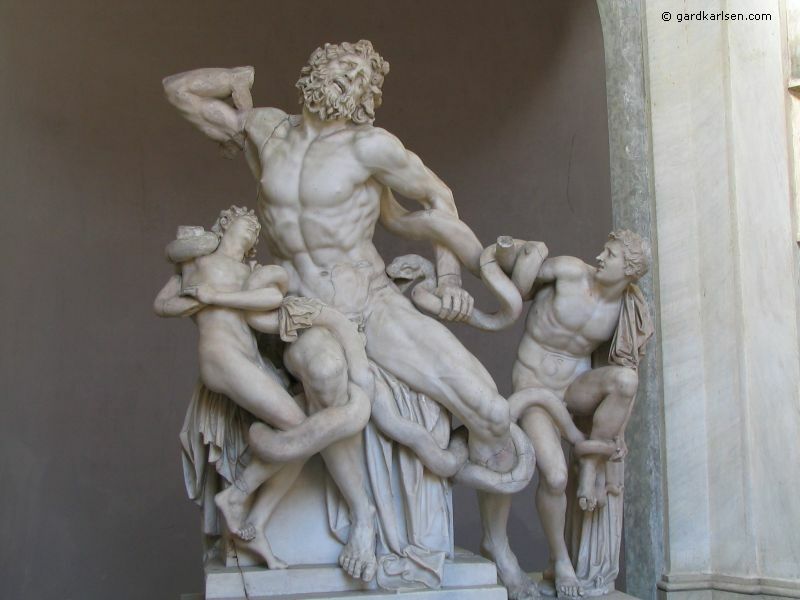 This 1st century AD statue shows the Trojan priest Laocöon fighting with sea serpents to protect his sons. The details on the statue are just stunning. Just look at the muscles, the veins and the rib cage. All of this makes the statue look alive. Along the route there are lots of rooms that impressed us. Breathtaking paintings in the ceiling, floor mosaics etc. Another room that impressed me was the Gallery of maps. Not only is it amazing with a 120 meter long room with an amazing ceiling. But the walls also contain maps that show Italian cities and places in the 1500s and it is so detailed. You can see aqueducts, buildings, trees etc. 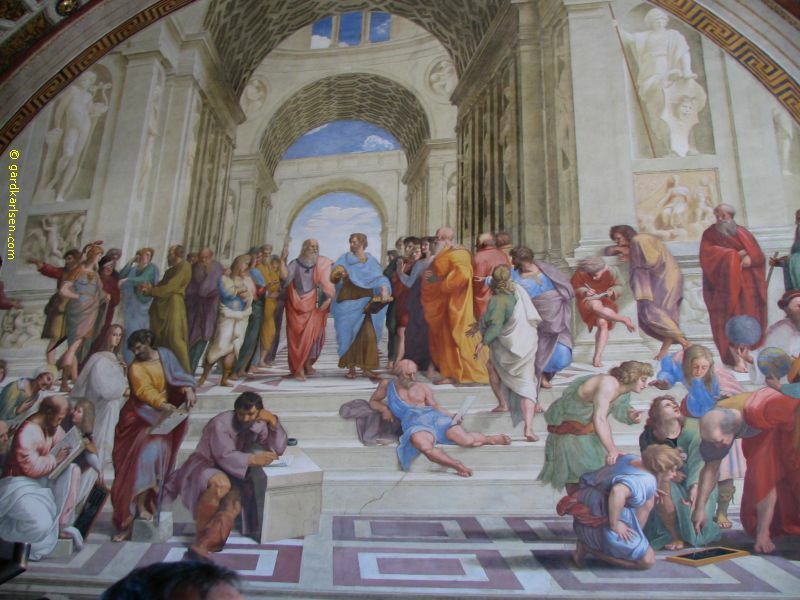 And then you have the Raphael rooms of course which contains beautiful frescos. I guess most people have their favourite but I enjoyed the “Room of the Segnatura” and the piece “School of Athens”. Not only is it beautiful and in amazing colours (remember that it was done around 1510…only a few years after Columbus sailed to America) but in this piece Raphael has also included portraits of fellow artists at the time such as Michelangelo, Leonardo da Vinci and Bramante. 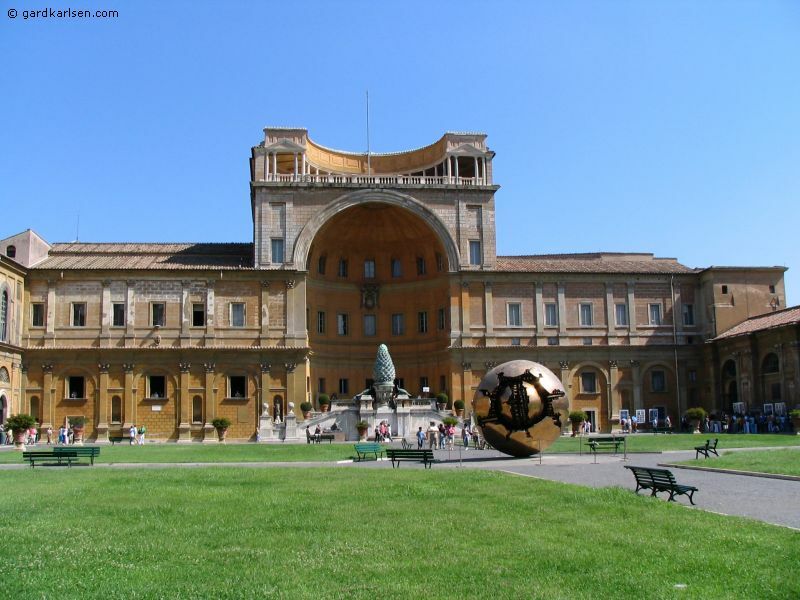 Check out this page for more information about the Vatican museum. The highlight of the entire tour is the Sistine Chapel (Cappella Sistina). 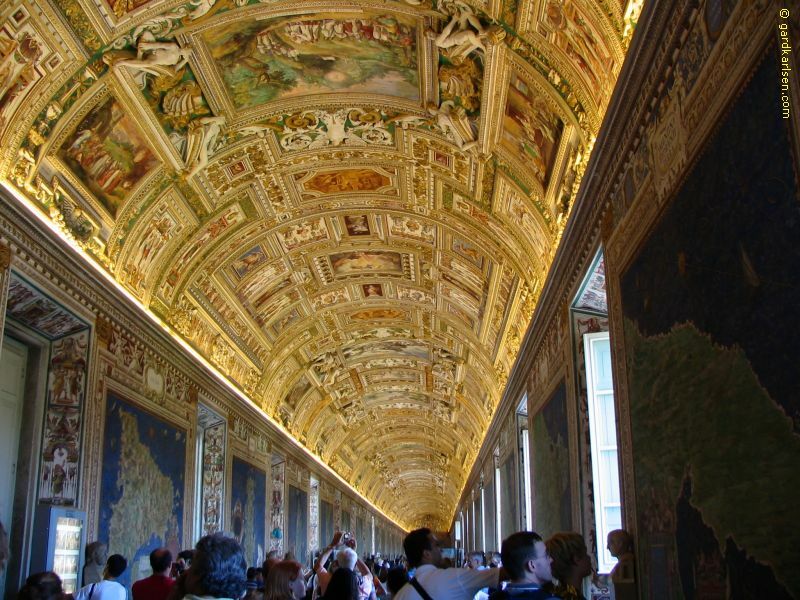 There are works of arts on the walls and in the ceiling but Michelangelo’s ceiling that is the famous attraction. When we got in, the chapel was really crowded and there was a buzzing sound caused by all the people talking to each other about the frescos. What was really noisy was the guards (that looked constantly peeved) going “shhhhhh” when they caught someone speaking and from time to time there would be an announcement over the loudspeakers informing people in different languages to be quiet and photography was not allowed. The guards would also clap and shout when they found people taking pictures or filming. In my opinion it is silly that it is not allowed to take pictures because most people were trying anyway. But even if there were a few distractions it is still safe to say that the Sistine chapel is quite breathtaking. The ceiling is made up of many small frescos that show stories from the bible and was made around 1510. The Last Judgment on the one wall is also quite amazing and Michelangelo worked on this piece between 1536 and 1541. My advice is to forget about taking ‘forbidden’ pictures while you are there…just look and be amazed :-). And then you can take a virtual tour of the chapel on this page. By this point we were a bit exhausted as we had seen treasures like nowhere else. But we were not done with the tour yet. 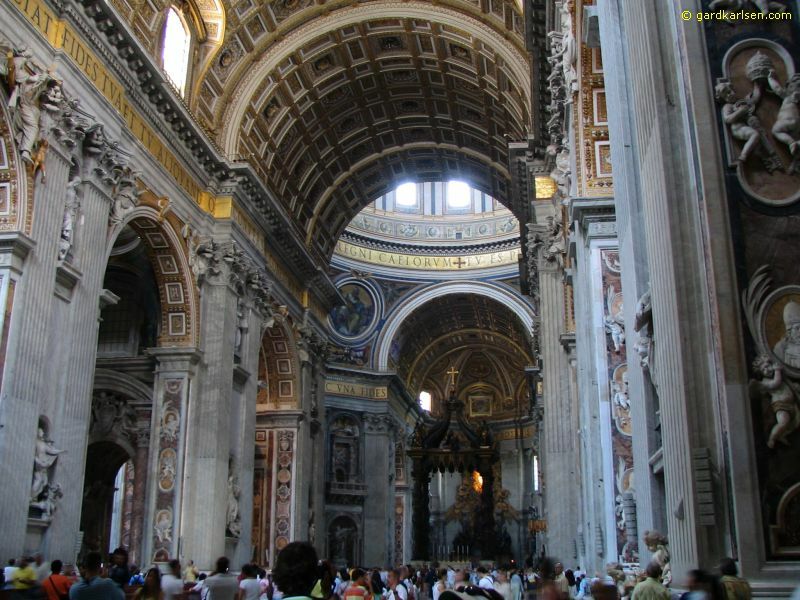 The last building we were going to visit was St. Peter’s basilica (Basilica di San Pietro)…the world’s biggest church. The size of the church is just amazing. 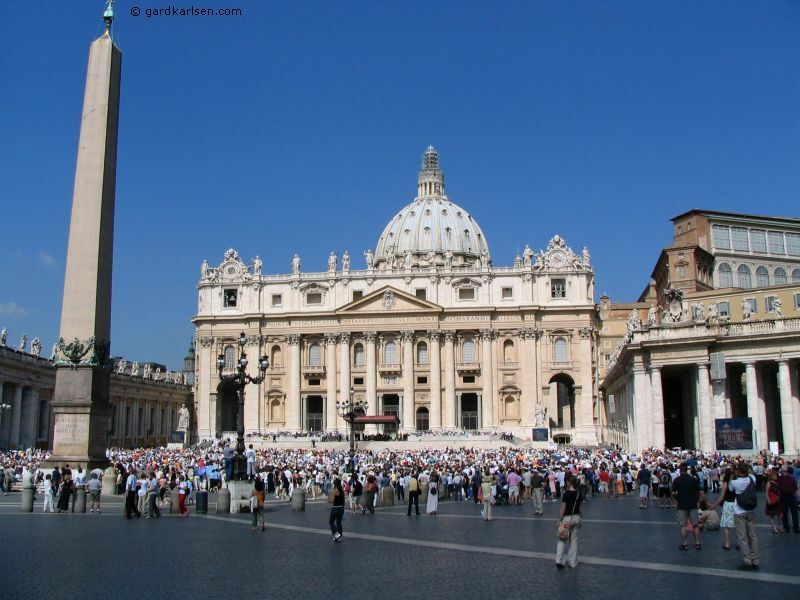 The church was built on the site of St. Peter’s tomb and some claim that his remains are still kept in the church but I doubt it - the body of one of the founding father’s of the catholic church so ‘freely’ accessible?. Tony took us to some of the unique pieces like Pietà the marble statue by Michelangelo from 1499. But it was very tricky to take good pictures due to the crowds, the light and the fact that it is kept behind a glass wall. 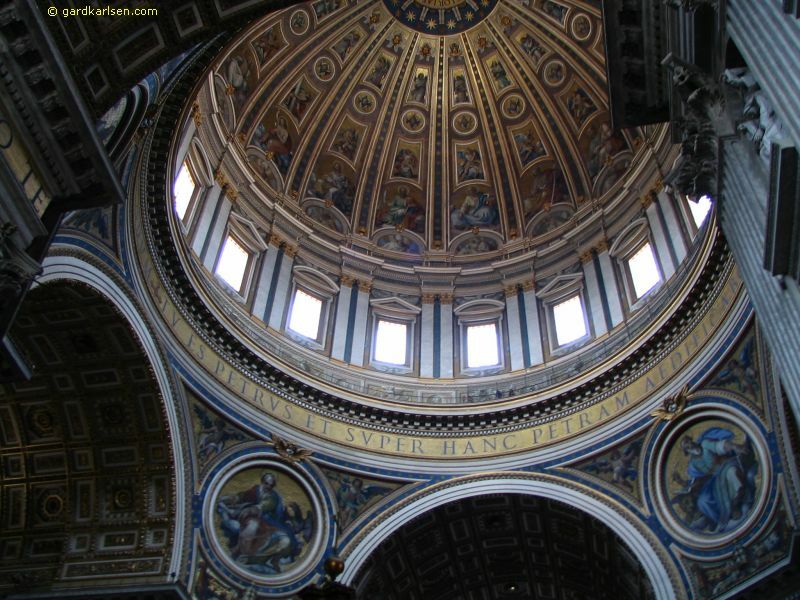 It was a bit hard to keep up with Tony as my eyes constantly glided towards the huge dome (also by Michelangelo) and the rays of light that came in through the windows created an almost divine effect (holy spirit shining down on us?). It is hard to really understand the size of the dome until you see the people that are walking around up there. 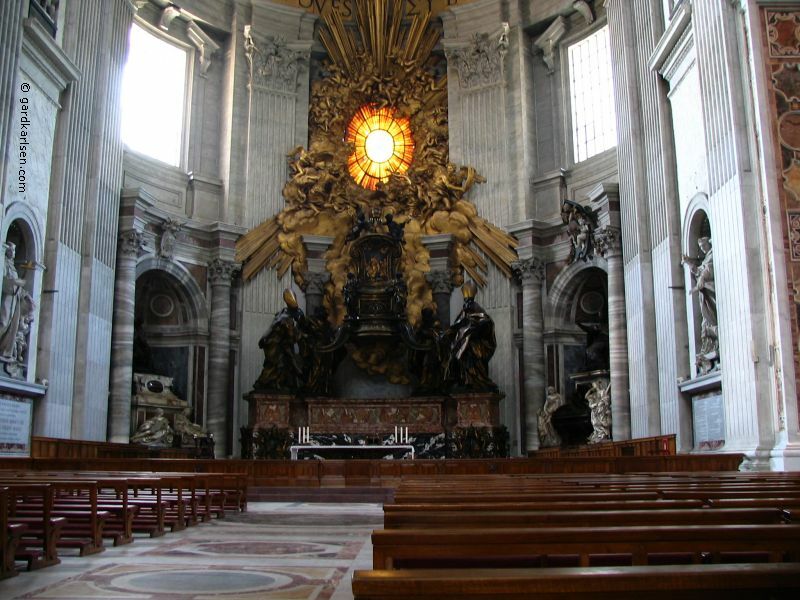 Other pieces that are beautiful are the throne of St. Peter in glory by Bernini and the 20 meter high baldacchino (also by Bernini). We also stopped by something that looked like a big painting. It turned out to be a copy of Raphael’s Altar of Transfiguration…and if you walk really close you will see that this is fact a mosaic! It took six people 9 years to finish this piece in 1767. We did walk around in there for quite a while but I think this is a place you can return to and always find something new. I have to admit that we didn’t go up in Dome to enjoy the view and I regret that. But hey we have to save something for a later visit as well :-) I would also like to do the Scavi tour to see the excavations of the Necropolis (City of the Dead) beneath St. Peter's. Please check out this page for more information about the church. We also returned to the Vatican at a later stage to participate in the general Papal Audience held every Wednesday from 11:00am. We didn’t get any tickets to get seats but we just showed up on the St. Peter’s square a few minutes before the “show”. The square was not that crowded actually but there must have been a few thousand people there. 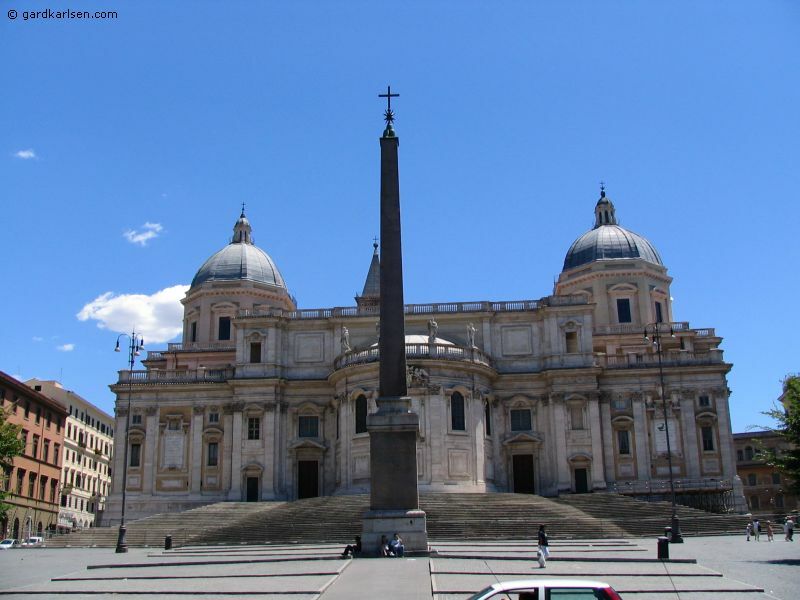 The square itself is quite a sight with the obelisk in the middle (brought to Rome by Emperor Caligula in 37 AD), two large fountains and the surrounding colonnade with the statue of 140 saints. 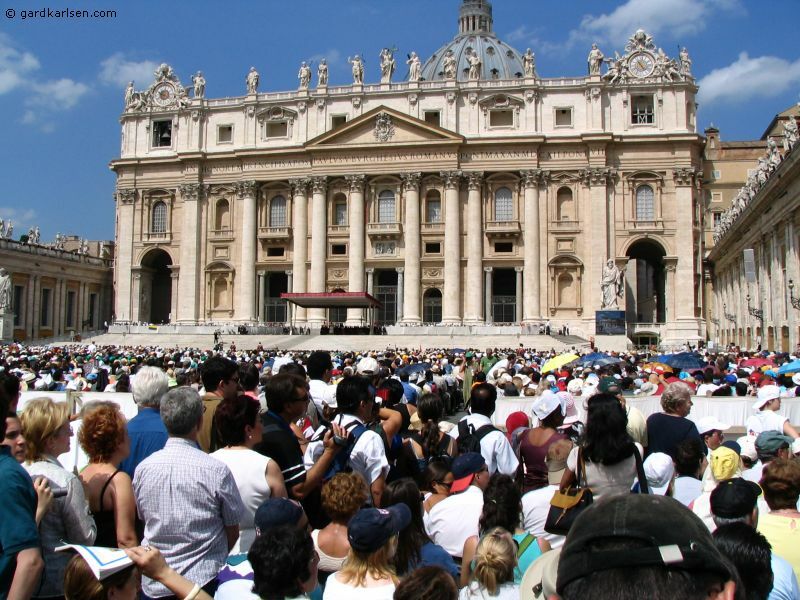 In connection with the papal audience there were several larger TV screens that were set up around the square. 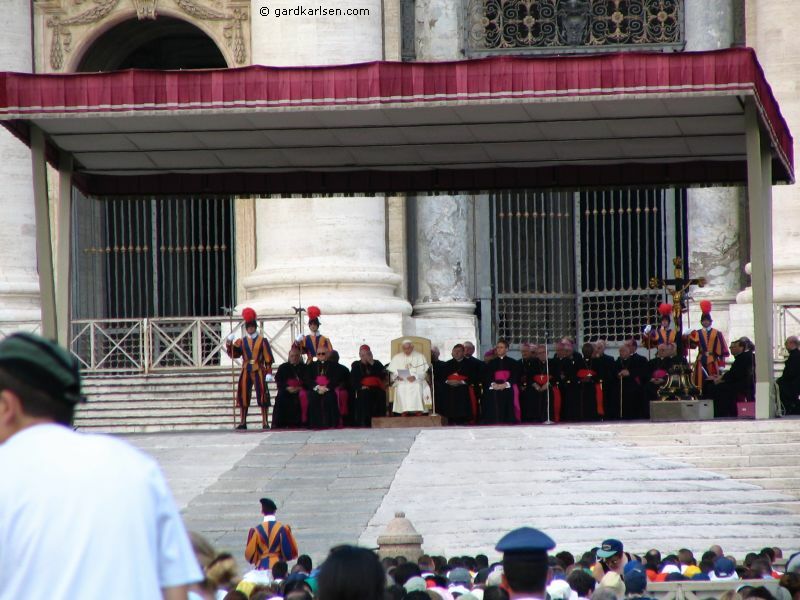 And after an introduction in different languages Pope Benedictus XVI came into the square on his car and he was driven around in the middle of the crowds. I hope that I don’t offend anyone by saying this, but it was more or less like being at a concert and the Pope was the star. The Pope ended up at the Church’s entrance and held his speech in different languages (French, Italian, Spanish, German, and English) - pretty impressive, I think. We didn’t stay for the whole ceremony but it was an interesting experience. 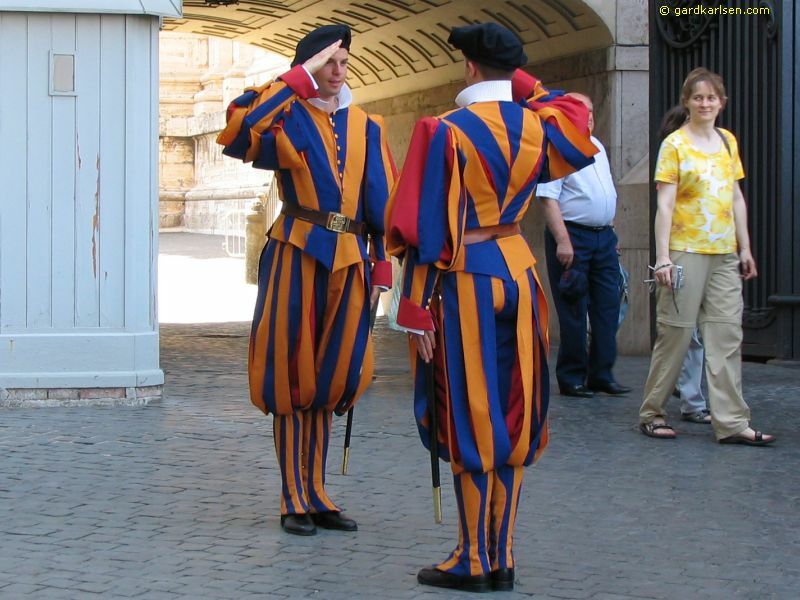 Take a look at the Vatican page for more information. 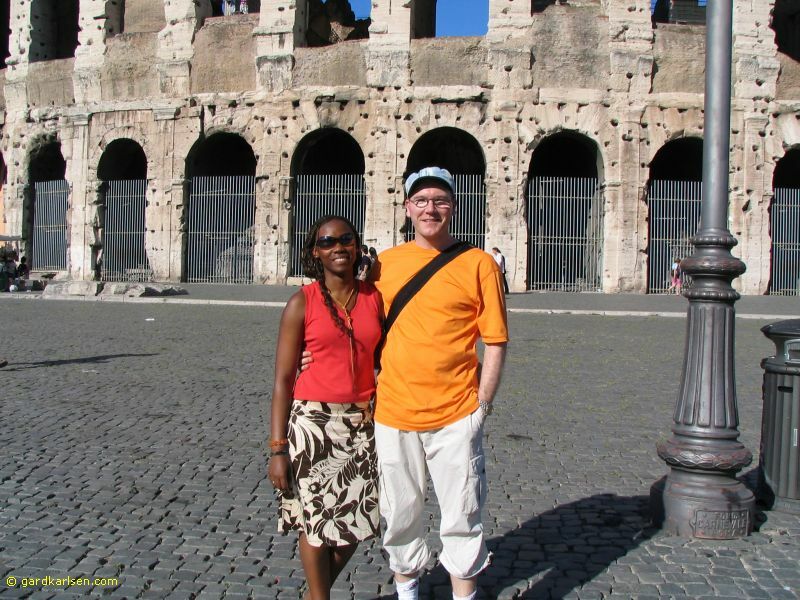 When I bought the Rome guidebook I had a hard time trying to find out how we should approach Rome. Obviously Rome has some world known attractions that had to be visited. We were not sure that we had picked the right area for the hotel. But I think I can summarize Rome with one word: WOW. We had an amazing stay in the Eternal City and there was so much to see and do. After you have seen all the well known monuments, churches, fountain, piazzas etc there is still a lot more to see. And if you get tired along the way there are plenty of places where you can relax, enjoy the fantastic Italian cuisine, the excellent Italian gelato or drink some good coffee. The centre of Rome is not really that big so if you are in good shape and have some good shoes you can easily walk from Termini to the Vatican. What probably amazed me the most about Rome is the long history. 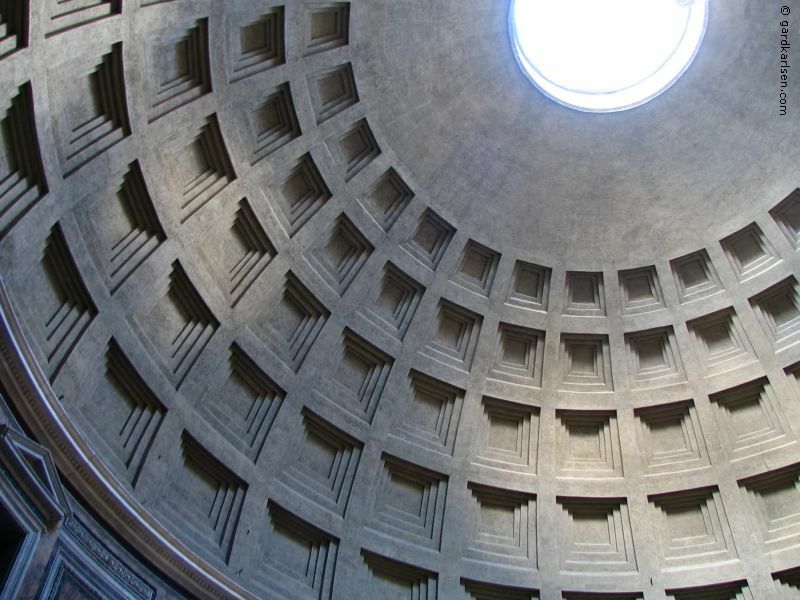 When we were living in crummy little huts around Stavanger there had already been several hundred years of an advanced civilization in Rome and huge temples and the Coliseum had been constructed. A trip to Rome really puts things into perspective. I have heard some horror stories from others that have gone to Rome. Pick-pockets, credit card fraud etc are just some of the keywords. So we were of course a bit sceptical before we went to Rome but I don’t think that Rome is any worse or better than other larger European cities when it comes to this. Keep an eye on your valuables in crowded places (like bus and metro) and you should be fine. I hope that you found this trip report useful please give me feedback if I have made mistakes or if you just have comments or questions. I can be reached on gardkarlsen@hotmail.com. If you would like to print this report you should try this PDF file for a better result. If you are able to read Swedish you should check out this webpage made by a Swedish/Italian couple living in Rome.